Sometimes authors are puzzled when asked if the book, say, a study of worms, is autobiographical. But with a book about language, more specifically, about the origin of words, the autobiographical question is legitimate. After all, language is one defining characteristic of humanity. In his latest book, Curiosidad/Curiosity, Raúl Guerrero interweaves language with autobiographical snapshots of his early encounters with words, guided by an eccentric and reclusive grandfather — the old man was kicked out of his City Council office for proposing a steep fine for every unnecessary word pronounced in the Council to teach by example to think before speaking. It’s really two books in one. 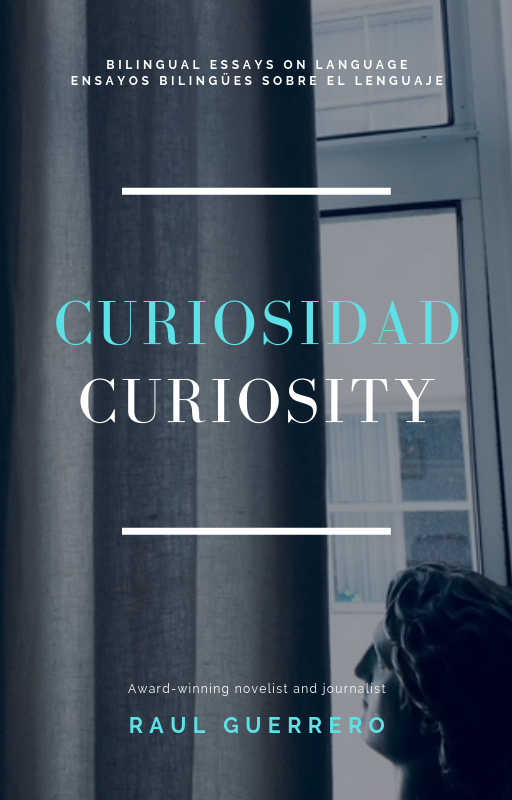 Curiosidad is the Spanish component, and Curiosity the English half. It’s not a bilingual book in the sense of placing the original text opposite the translation. Both versions approach the Spanish-language, the central topic of the book, following distinct avenues. The book contains 12 essays for each language and a longer piece of fiction, Un tango llamado Rosario, and The Birth of Castile. Most of the essays have been published by publications and encyclopedias worldwide. Siempre me fascinaron las palabras. Diminutas embarcaciones que atraviesan las venas de la historia, la geografía, ideas, cultura, que atraviesan la vida misma. Y el día que descubrí la etimología, la ciencia de encontrarles el origen, me sentí como si hubiera accedido al gran secreto de la vida. Porque la unidad primordial de la palabra es la letra, la primera etimología que investigué fue la de letra y después el origen de la letra A. Letra deriva de la voz romana littera. Así, el profesor de las primeras letras se denominó litterator. De la littera latina también derivan literatura, literato y letrado. Letra: signo o elemento gráfico con que se representa un sonido del habla. America and América do not mean the same. Since Colonial days, the British used America for the colonies on the east coast of North America. For the Spanish Crown, América encompassed the entirety of the continent. Independence did not alter the differing assignations. For citizens of the new United States, America became their country, and American their nationality. For Latin Americans, America continued to connote the continent. The book is ideal for Spanish aficionados in both languages. Essayist and novelist, Raul Guerrero is the editor of Downtown News and directs the Downtown Arts + Science Salon (DASS), in other words, a curious man. The etymology of curiosity, he explains, is the Latin curiosita, the desire to know. Curiosidad/Curiosity available April 18, 2018, in paperback and ebook.